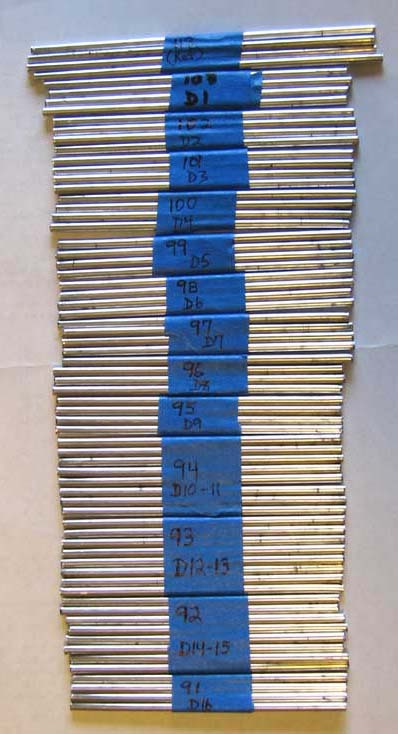 Shown here are all of the parasitic elements prepared for the four 48" 23 cm Yagis I used on a 23 cm beacon array. It does help to organize the elements like this prior to attachment to the boom. For material, I usually use 1/8" aluminum welding filler rod. it is inexpensive, easily cut to size with wire or bolt cutters, and holds up well in weather. Once cut to size, trim the ends flat with a file. These antennas were designed for full metal-to-metal contact between the boom and the parasitic elements, so be certain to keep that in mind when designing an antenna with whichever calculator you use. A simple method for attaching the elements to the boom is described later in the process.